A member of the Moab Live cloud - owned by James McGillis. MarinaJim.com is a member of the MoabLive.com network of websites. The mission of MoabLive.com is to increase the public's awareness of the beauty of national parks and national monuments in the West, and the preservation of unique landforms and enhancement of outdoor lifestyles. A complete listing of all domains owned by MoabLive.com may be accessed at the bottom of this page or the Links Page at Moablive.com. Are you looking for the most expensive "tsunami-zone" real estate on the trendy Westside of Los Angeles. Look no further than Marina del Rey. With homes on the Venice Strand going for millions of dollars, you can have your cake and eat it too while sliding out to sea in your hot tub. 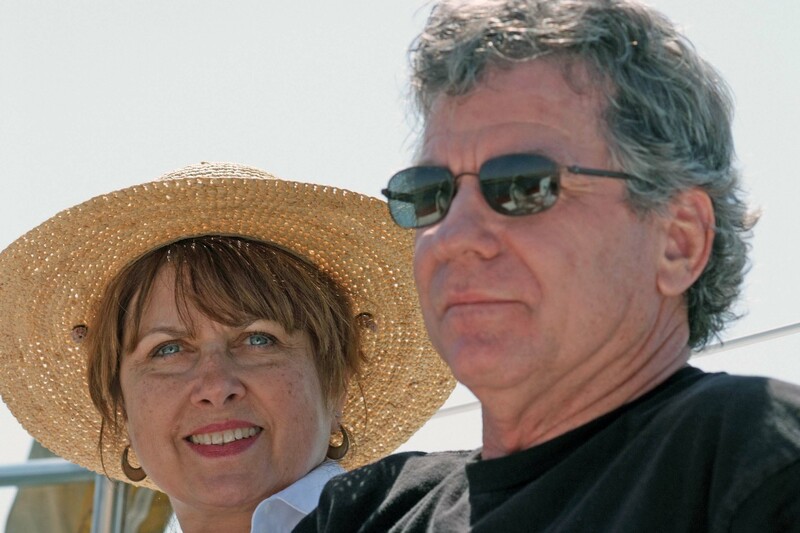 From 2002 until 2005 I lived aboard my Ericson 35 sailboat in Marina del Rey. Before the County of Los Angeles built Marina del Rey in the 1960s, it was a vast mudflat, bordered on one side by Ballona Creek. Until the 1930s, Ballona Creek was the alternate mouth of the Los Angeles River. After that time, the L.A. River was channelized, creating a permanent mouth many miles south, on the far side of the Palos Verdes Peninsula. That begs the question... what created the vast mudflat that the county dredged to create Marina del Rey? Some say sediments from the errant flow of the old Los Angeles River created the mudflat. Others say the entire area was inundated by a prehistoric tsunami. It was not until about 2010 that the City of Los Angeles and the County of Los Angeles, which owns the Marina, installed tsunami warning signs around Venice and Marina del Rey. If you look at an overhead view of Santa Monica Bay, you will see that the entrance to Marina del Rey lies at the apex of that crescent shaped bay. Soon after completion of Marina del Rey, a winter storm sent a wall of water up the main channel, displacing docks and ruining the few boats then moored there. After that, the detached breakwater was constructed, in an effort to keep storm surge from again decimating the area. 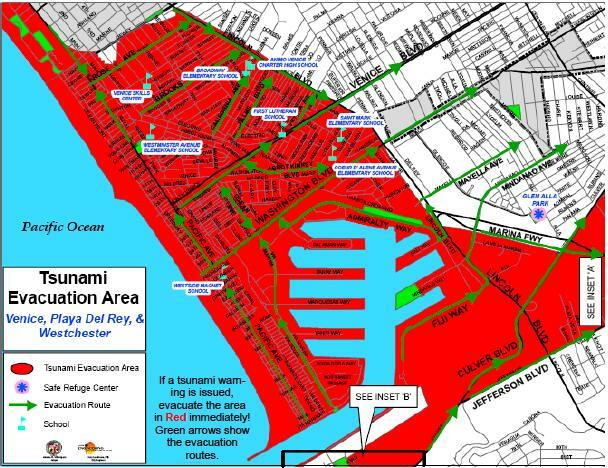 Potential storm surge may have been abated by the construction of the detached breakwater. However, recent studies show that a wave as large as the 2011 tsunami in Japan could sweep over that breakwater, inundate Venice Beach and flood as far as 2000 meters inland. If you are looking for a long-term investment in Westside real estate, I suggest that you purchase outside of the tsunami zone, well beyond Lincoln Blvd. Or, if you are a risk taker, purchase an expensive home on the strand in Venice or live anywhere in Marina del Rey. 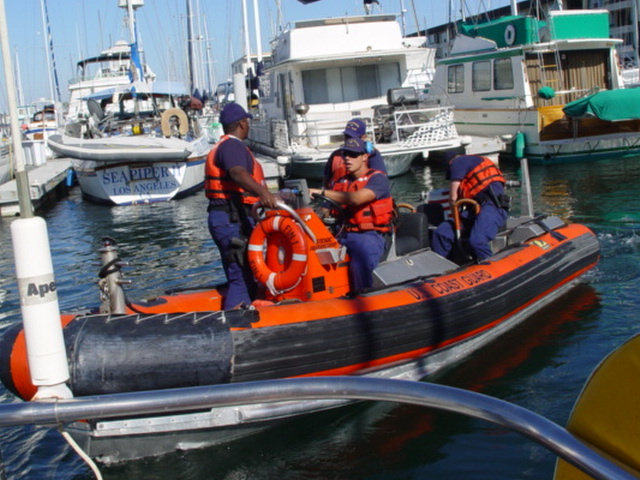 While returning from Isthmus Cove, Catalina Island to Marina del Rey, California, Carrie McCoy and I received a visit from the U.S. Coast Guard. Perhaps it was because we were the only boat in the Main Channel that we received this special pleasure. As I was setting up the boat for our return to the 1300 Dock in Basin B, a group of four service members deployed in an orange and black inflatable boat pulled alongside. The person in charge asked us how long it had been since the Coast Guard had boarded and inspected our vessel. “Never”, was my response. Within a minute, two men hopped aboard WindSong and then asked for my driver’s license and the boat registration slip. During our sail from the Isthmus Cove at Catalina, we had seen rough weather and the registration had fallen from the chart table down to the sole of the boat. There it remained hidden throughout our encounter with the Coast Guard. After inspecting our safety flares for date compliance, we were “let go” with a warning on the missing registration. By the time we completed our onboard discussions, we arrived at the dock. With there being no one else there to help, I asked one of the Coast Guardsmen to help secure WindSong to the dock, which he did. Before they departed, I asked our Marina del Rey Homeland Security boarding party to pose for a quick picture, which they proudly did. 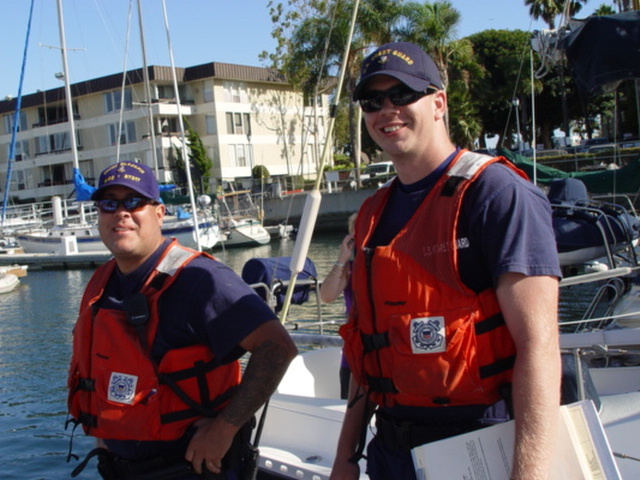 In these uncertain times, it is good to know that the small boat harbor known at Marina del Rey and nearby Venice Beach are under the watchful eye of the U.S. Coastguard. Copyright © 2017 Moablive.com. All rights reserved. Design by Savalas.TV.